Last year I reviewed the Shaq Cyber Hoop Shot on BestOutdoorBasketball.net. 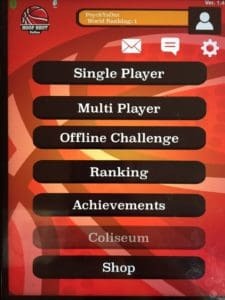 This arcade basketball game from Sportcraft featured an Iphone App that allowed players to compete with one another across the globe. 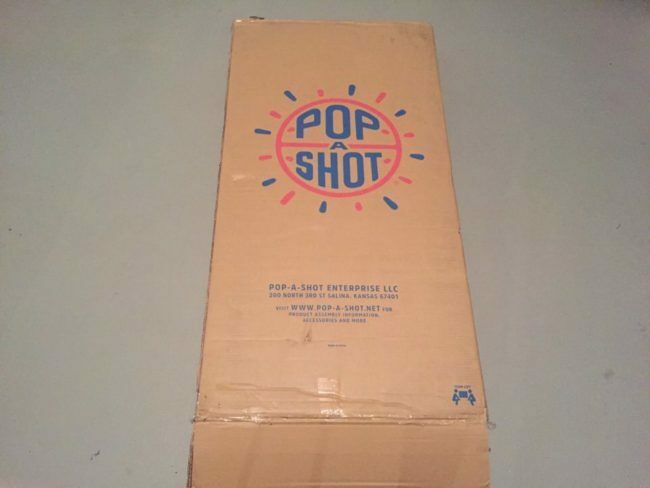 This year I’m taking a closer look at the newer 2-Player Sportcraft Arcade Basketball Hoop Game. 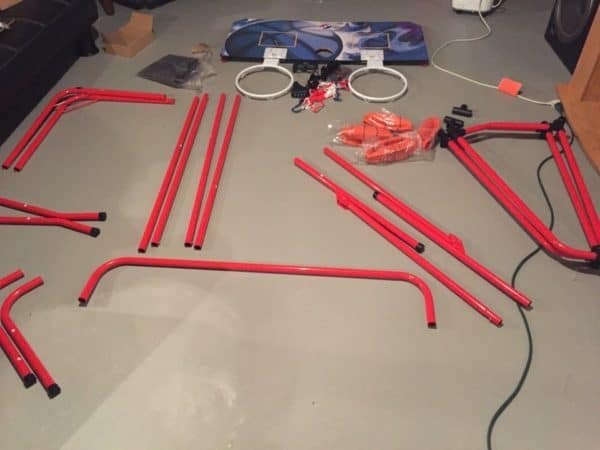 In this review I will breakdown the assembly process, features, and game-modes that come with this basketball arcade system. 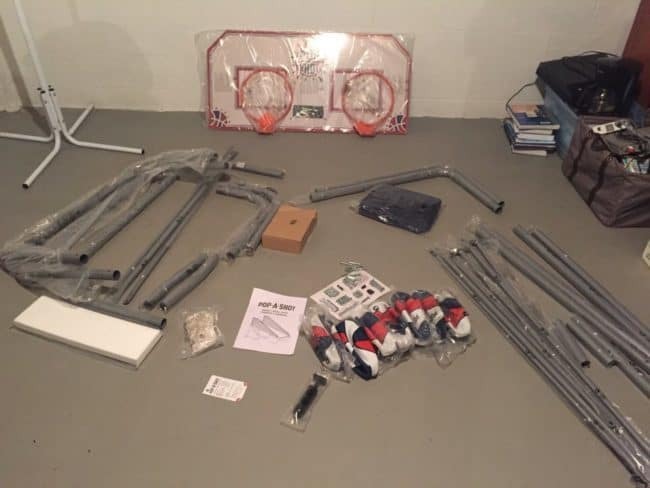 The 2-Player Sportcraft Basketball Arcade System is the easiest full-size basketball arcade system to assemble that I’ve reviewed. You don’t need any tools or screws to put this system together. 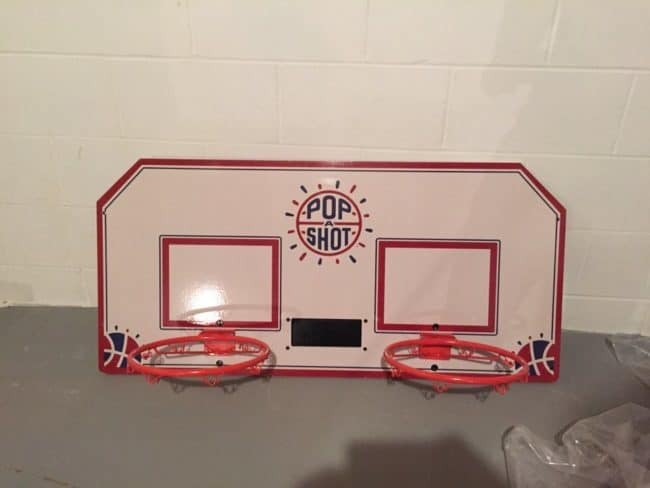 In fact, the 2-Player Sportcraft Basketball Arcade System uses pins that click together so that each piece is easily attached. You can see these pins in the picture below. Sportcraft claims that it only takes 10 minutes to put this system together. That may be true for someone who is familiar with the system, but for me it took around 20-25 minutes. Either way, compared to the Shaq Cyber Hoop Shot, which took me 2 hours, this was lightening fast. The biggest issue I had with assembly was making sure that I didn’t assemble parts backwards, which happened on a couple occasions. Thankfully, because of the easy to use pins fixing my errors was painless and didn’t cost me much time. 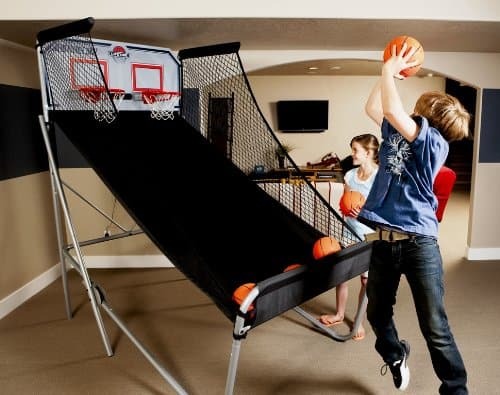 The size of this arcade basketball system is noteworthy. The dimensions are 80″X 46″X 81.5″. 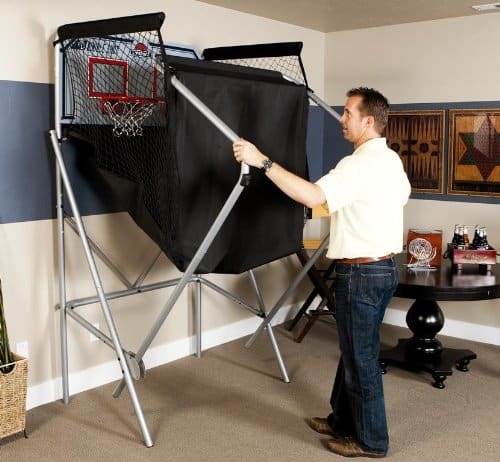 For this basketball arcade system to fit in your room you’ll need a ceiling that is at least seven feet tall. Otherwise you risk the top of the system hitting your ceiling. 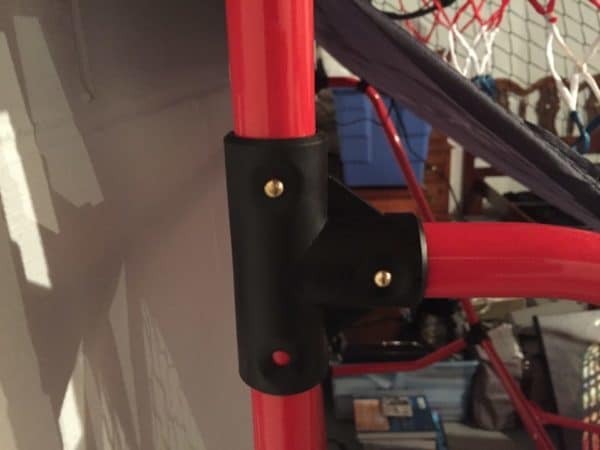 With the Sportcraft 2-Player Arcade Basketball System comes two steel rims that are basic, but get the job done. Last year’s Shaq Cyber Hoop Shot rims had poor welding that let to the rims breaking over time. Hopefully, Sportcraft has fixed this issue. Time will tell, and I’ll keep you updated on how the rims hold up after more use. Between the two rims is a digital scoreboard that keeps track of your score and the time left. 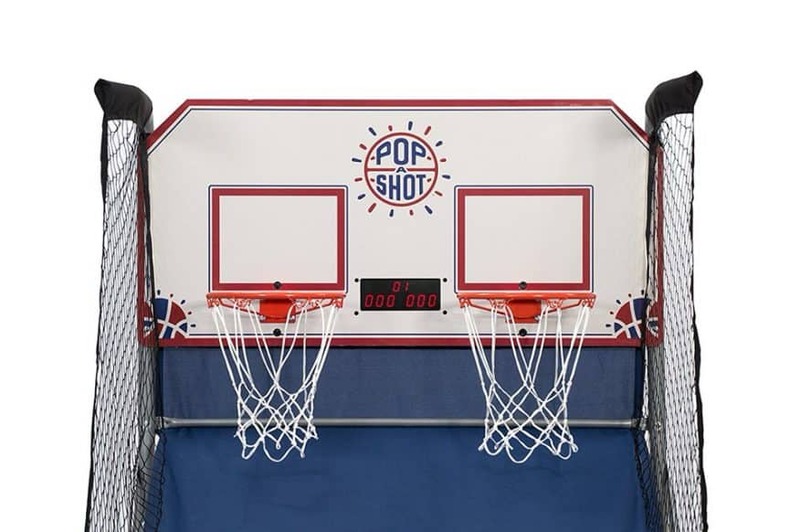 There are a set of buttons that hook to the frame of the hoop that allow you to turn on the basketball system, select the game mode, time, and how many players. 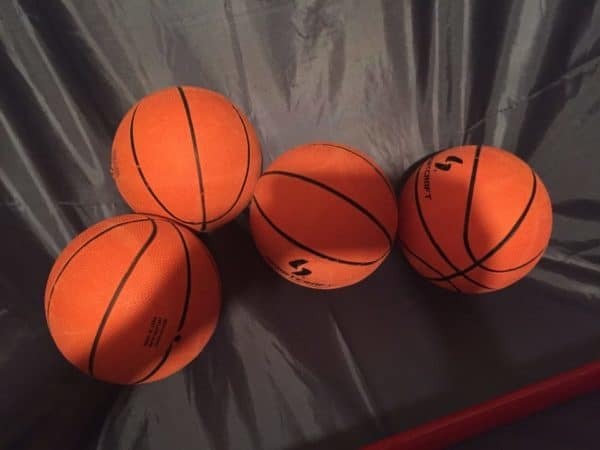 Baskets are counted using plastic levers that are triggered when the ball goes through the hoop. 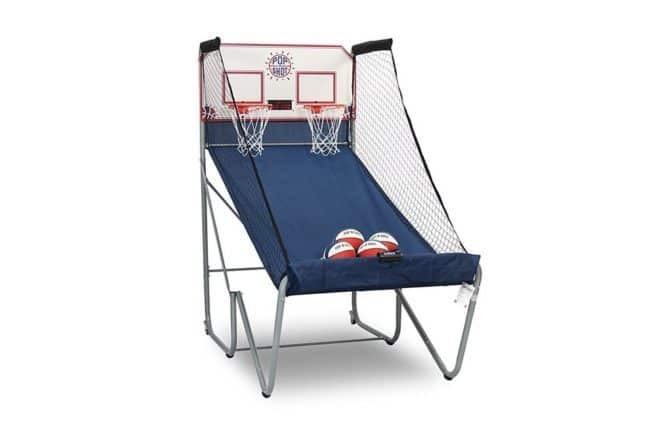 These are pretty accurate, but may not count a basket if two balls go through the hoop one right after the other. Overall, it certainly works for the purpose of recreation. The backboard is a simply plywood materials and nothing special. 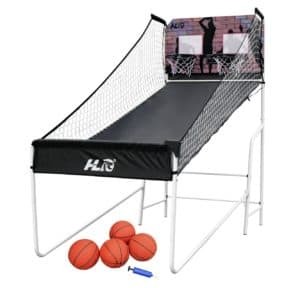 But it does a fine job to bounce the basketballs off the backboard and into the hoop with velocity. The scoreboard is well lit so that you can see your scores and the time left. 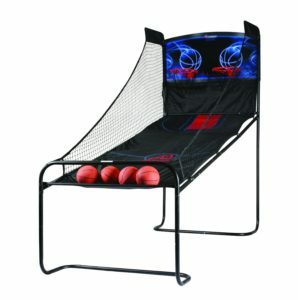 The Sportcraft 2-Player Arcade Basketball System comes with eight different game modes included. To be honest I have not played all of them because I have not had time, but I will explain each of them in detail. 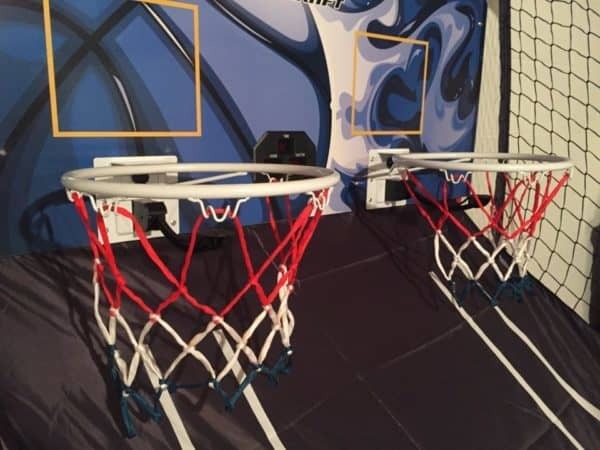 Beat the Clock– Standard arcade basketball game where you try to score as many points as possible in a specific timeframe. Buckets are worth 3 points in the last 10 seconds. Beat the Clock, 3 Point Version– Same as Beat the Clock, but each bucket is worth 3 points throughout. Battle Back– This game requires 2 players. Basically each time you make a basket, your opponent loses points. So if you score you get 2 points and you opponents gets -2. 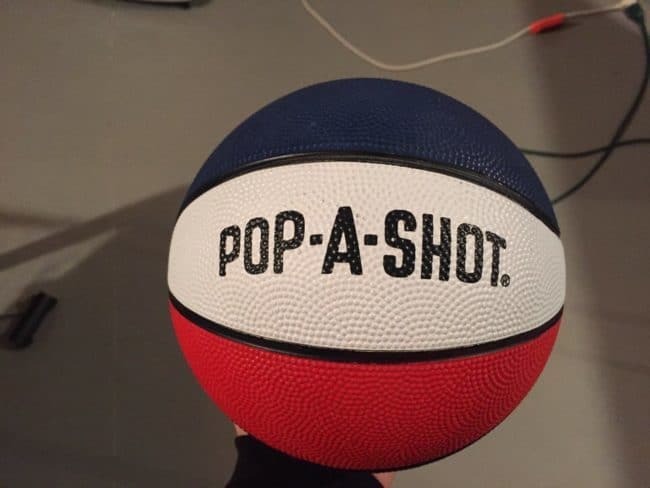 First player to 10 points wins. HORSE– The same game that millions grew up playing in their driveways. Check Point– Players have to score a certain number of points in a specific time to continue playing. There are 4 levels with ascending point targets (24, 52, 68, and 86). Around the World– Allows you to shoot from 5 different areas and will stop the clock once 10 points are made. The players who makes the 5 shots in the shortest amount of time wins. 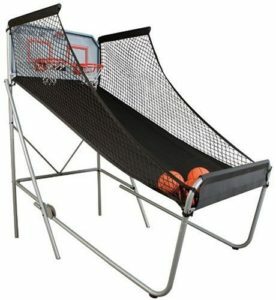 Left and Right– Alternate between the home and visit baskets and score as many points as possible in a specific time. One to One– Each player will play a round individually and the player with the highest point total wins. 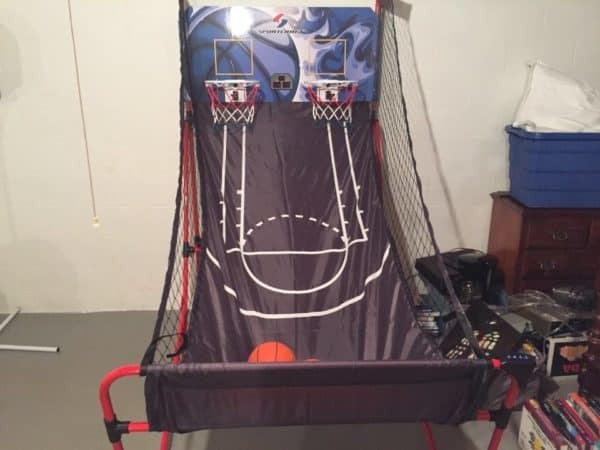 This arcade basketball system is very affordable and priced in the $105 range. 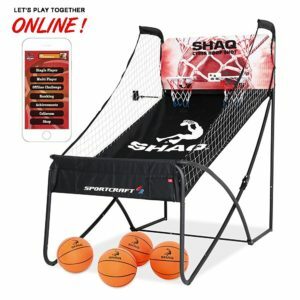 Compared to other similar arcade basketball systems, such as the Lifetime Double Shot, this price is a steal. 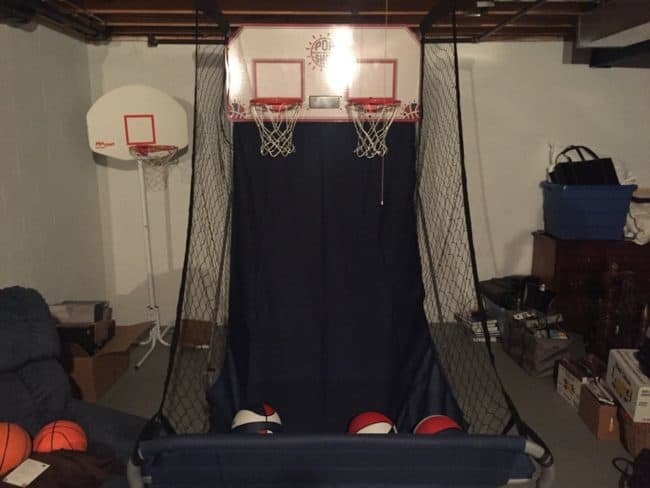 Because of this if you are on a tighter budget then be sure to consider the Sportcraft 2-Player Arcade Basketball System.